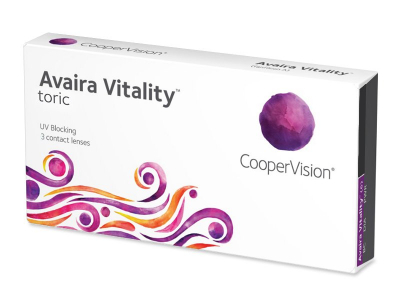 Avaira Vitality Toric contact lenses are produced by CooperVision as an improved replacement for the original Avaira Toric lenses. These innovative bi-weekly lenses have feature a special design that promotes comfort and improves the quality of vision for users with astigmatism. Avaira Vitality Toric lenses are made from a technologically advanced silicone-hydrogel material; their water content is 55% and they have oxygen permeability of 90 Dk/t. We also offer Avaira Vitality Toric lenses in a larger pack of six lenses. Avaira Vitality Toric have an improved lens design to effectively correct astigmatic defects, called Optimized Toric Lens Geometry. These lenses are a significant improvement over the previous version of Avaira Toric lenses thanks to their improved stability and reduced friction. CooperVision laboratories have embedded a class-1 UV filter into every Vitality lens. This filter blocks up to 90% of UVA and 99% of UVB radiation. It is important to remember, however, that the contact lens only covers a small part of the eyeball, and protective sunglasses should always be worn outside for complete protection.